Accelerate Resources (ASX:AX8) is an emerging explorer with a diverse commodities spread that balances forward-focused battery metals — cobalt, nickel and copper — with safe-haven gold. Since we first crossed paths with AX8, this fast-moving ASX junior has been flush with news flow. What you’ll come to understand if you are following the news trail, is that AX8 is hoping to establish Australia as a hub for critical electric vehicle (EV) materials. Given the pivotal Tasmanian setting of its flagship Mt Read Cobalt Project, the company has a vantage point to the Asian EV market — especially important, given China’s status as the largest EV market on the globe. Considering that the global fleet of EVs is expected to reach 125 million by 2030, AX8 could scarcely have picked a better time, place, or commodities cocktail. With these forecasts in mind, AX8’s recent news bodes nicely. As it announced in early September, the junior explorer has unearthed a large, copper-cobalt porphyry system at the Thomas Creek prospect, which sits within the Mt Read Project. This discovery is based on data from the recently completed Thomas Creek diamond drilling program, which targeted a large induced polarisation (IP) anomaly below a surface copper-cobalt anomaly. Drilling has successfully intersected a fertile porphyry system containing several intrusions associated with anomalous copper-cobalt grades. Assays from three diamond drill holes show that high grade cobalt and copper was intersected including, 8 metres at 0.11% cobalt, 3 metres at 0.22%, 1 meter of 0.57% and 46 metres at 0.11% copper. Drilling has successfully intersected a large porphyry system containing several intrusions associated with anomalous copper-cobalt grades. 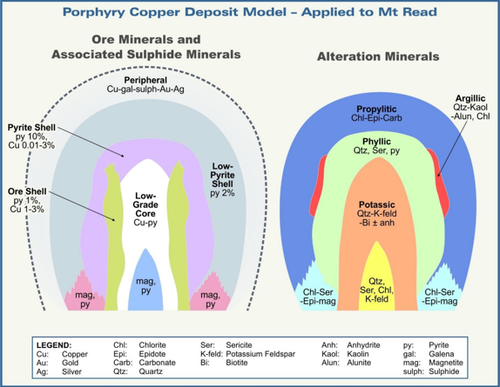 Interestingly, porphyry style mineralisation systems generate some of the largest ore deposits in the world. Generally, these are at least 1000Mt and have long mine-lives, containing upwards of 1Mt copper with by-products of gold, silver and/or molybdenum. On top of that, these kinds of systems also have large alteration zones which generate significant accumulations of magnetite. All three holes intersected the intermediate alteration phase associated with this style of mineralisation system. Impressively, Thomas Creek also has a large aeromagnetic and potassium radiometric footprint of 13 square kilometres. Yet, as with all minerals exploration, success is not guaranteed — consider your own personal circumstances before investing, and seek professional financial advice. Setting counts for a lot here. The broader Mount Read Project is situated on the Sorrell Peninsula, and encompasses a belt of Cambrian volcano-sedimentary rocks correlated with the Mount Read Volcanics (MRV). The MRV hosts all western Tasmania’s significant base and precious metal mines and mineral occurrences, several of which have been significant producers of base metals for over 100 years. Mt Lyell, for instance, is Australia’s oldest continually operating mining field. The mine, which began full-scale production in 1896, has produced more than 1.8 million tonnes of copper, 62 tonnes of gold, and 1300 tonnes of silver to date... and it’s not far from where AX8 has set its sights. All in all, with some promising results and plenty more to come, all systems are go for AX8 at it keeps its corporate foot firmly on the (electrified) accelerator to tap the full potential of this prime location. In this speedy spirit, let’s get straight to the latest on this $5.5 million-capped junior’s radar. 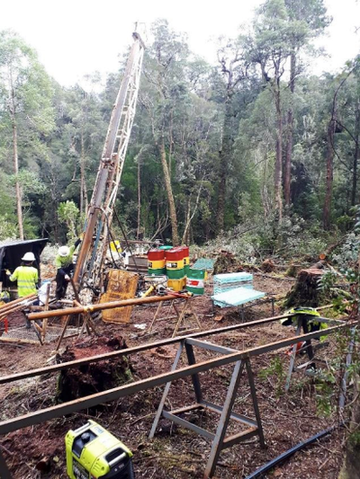 We first introduced you to ASX micro-cap, Accelerate Resources (ASX:AX8) in June, with the article, ASX Newcomer Chases Tasmanian Battery Metals and WA Gold — a title that tells you quite a bit about where this company’s strategic focus lies. In that piece we took a microscope to its flagship Tasmanian Mount Read Cobalt Project, as well as its WA gold projects. Cobalt prices have risen fourfold in the past 2.5 years. As the Energy & Capital article below explains, in 2018 alone, cobalt demand is expected to be 50% higher than it was last year. Bloomberg analysts believe demand could surge to some 90,000 metric tons by 2030 — and that’s just in the battery sector. Cobalt supply, moreover, will need to more than double to meet demand from EV makers. 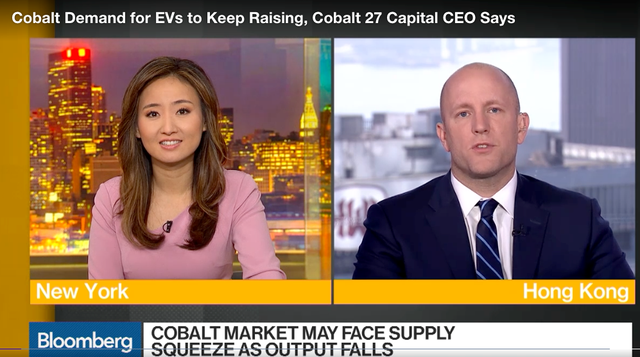 As Anthony Milewski, Chairman and CEO of Toronto-listed Cobalt 27 (CVE:KBLT), told Bloomberg, the current supply of 100,000 to 120,000 tonnes per year will need to grow by two and a half times if EV sales reached a 25% market share by 2025. With that in mind, AX8 could be in just the right place — and exploring at just the right time — to shake up these discordant supply/demand dynamics. Tasmania has remarkable geological diversity and has been a significant minerals producer for more than a century. The state has had a long, prosperous history of mining, and has yielded rich mineral wealth to the tune of around $150 billion of extracted mineral commodities in current-day dollars. Mt Read is also situated within the Tasmania Mining Strategic Prospective Zone, which enables access to certain areas of the state deemed to have high mining potential. On top of that, there are five major base and precious metal mines all along the Mount Read Volcanic Belt, including the aforementioned Mt Lyell. 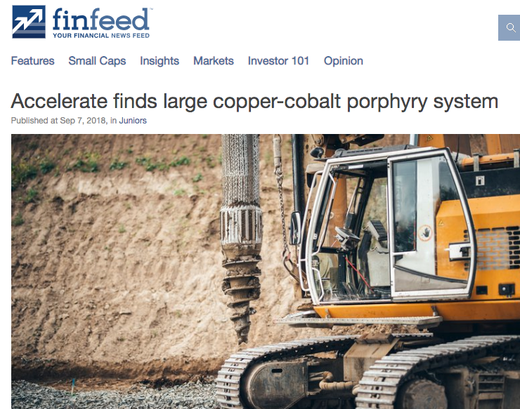 With that in mind, AX8’s latest news is pretty impressive having discovered a large, copper-cobalt porphyry system at the Thomas Creek prospect. It should be noted that AX8 is an early stage play and anything can happen, so seek professional financial advice if considering this stock for your portfolio. This discovery is based on data from the recent Thomas Creek diamond drilling program, including analysis and interpretation of geology, geochemistry and geophysical data sets. 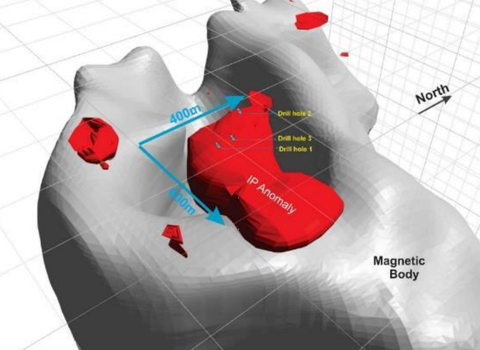 Drilling targeted a large IP anomaly below a surface copper-cobalt anomaly. Assays from three diamond drill holes — TCDD001, TCDD002 and TCDD00 — show high grade cobalt and copper was intersected including 8 metres at 0.11% cobalt and 46 metres at 0.11% copper. As hoped, the drilling successfully intersected a fertile porphyry system containing several intrusions associated with anomalous copper-cobalt grades. All three holes intersected the intermediate alteration phase associated with this style of mineralisation system. Results received from hole TCDD003 confirms the presence of broad zones of disseminated cobalt-pyrite mineralisation associated with higher grade cores, including 32m at 0.04% cobalt from 280m in TCDD003, which includes 8m at 0.11% cobalt from 299m, associated with semi-massive and stringer pyrite veining, located below a surface sampling location which was sampled in 2017. Similar cobalt-pyrite mineralisation was intersected in hole TCDD001, which included 3m at 0.23% cobalt from 150m in a semi-massive pyrite vein, within a zone of coarsely disseminated pyrite. 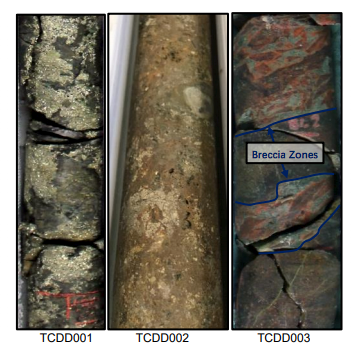 The anomalous copper in TCDD002, 46m at 0.11% copper from 114m, confirms the presence of copper inside the interpreted pyrite shell of the porphyry system. TCDD001, 150.7 to 151.05m, semi-massive to massive pyrite associated with anomalous cobalt assay results; TCDD002, 100.6 to 100.8m, semi-massive pyrite associated with minor zone of anomalous copper; and TCDD003, 81.1 to 81.3m, potassic alteration in brecciated fault zone with associated disseminated pyrite. 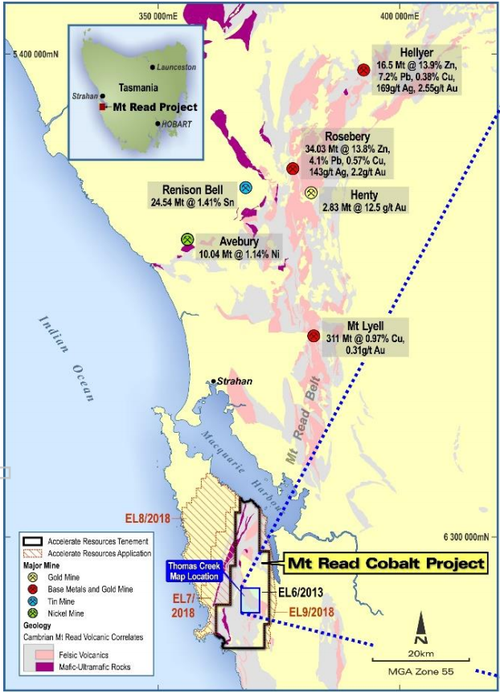 The right location — Mt Read is located on a correlate of the Mt Read Volcanic Belt, with known porphyry mineralisation in the region at Mt Lyell copper-gold-silver mine. The right geology — Multiple felsic-intermediate intrusions are present. The right geophysical signature — Correlating aeromagnetic, radiometric and IP anomalies. It’s large in size — 13 square kilometre aeromagnetic footprint and 13 square kilometre potassium radiometric footprint. Right geochemical signature — Matches porphyry style alteration zones. Encouraging alteration in all holes, plus zones of proximal potassic alteration associated with sulphides. From here, ongoing detailed analysis and systematic programs of work will be instrumental in establishing economic zones of mineralisation within this large porphyry system. Near-term plans include detailed airborne magnetic and geophysical surveys and obtaining regulatory approval for additional diamond drilling. On top of its promising Thomas Creek-related activities, AX8 also kicked off diamond drilling to test for nickel-cobalt potential at the Young Henry prospect at Mt. Read in late August. At the time of that announcement, drilling was at a depth of 50 metres with a planned depth of 200 metres. The hole is designed to test a 300 metre long, south-south-west plunging electromagnetic (FLEM) conductor, which sits below gossanous soil samples anomalous in nickel, cobalt, copper and zinc, and has the potential to indicate an accumulation of sulphides. The FLEM survey aimed to further define a previously identified 300 metre long airborne VTEM conductor near the northern end of a belt of fault bounded mafic-ultramafic rocks. The survey comprised a 300 x 300 metre loop with EM readings conducted on 75 metre spaced lines. 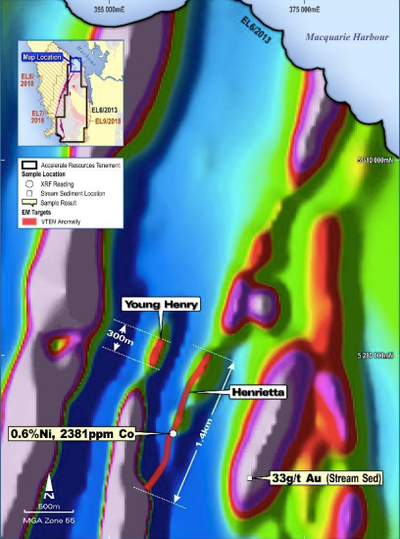 The Young Henry prospect lies immediately west of the 1.4 kilometre long Henrietta VTEM anomaly, and is 18 kilometres north-north-west of the Thomas Creek copper-cobalt-nickel prospect. The promising Henrietta target will be subject to field exploration, with surface samples having returned cobalt grades up to 0.14%. Keep in mind that it is an early stage of this company’s development and if considering this stock for your portfolio you seek professional financial advice. With its holdings in historically well-mineralised Tasmania proving to be rich in cobalt and copper, and with an emerging track-record in efficiently progressing high-impact drilling campaigns, AX8 is quickly demonstrating that it’s a force to be reckoned with. With near term plans to complete detailed airborne magnetic and geophysical survey, plus detailed ground geophysical surveys, as well as obtaining regulatory approval for additional diamond drilling there should be plenty of newsflow rolling in. These are still early days yet, and this junior explorer — which only just made its ASX debut in February — is currently valued by the market at a tiny $5 million. Yet with its diverse commodity spread and powerhouse team, this ‘right place, right time, right commodities’ story could well be a strategic entry point into the rapidly accelerating EV space — one that’s only set to get bigger.